Ceasar Medina, 17, was shot and killed by Jeremiah Smith who was released early due to WA DOC computer error. Davis Law Group, P.S. has been retained by Veronica Medina-Gonzales. Medina-Gonzales is the mother of Ceasar Medina who was killed on May 26, 2015 by an inmate that was released early by the Washington State Department of Corrections due to a computer glitch. Medina was fatally shot and killed by Jeremiah Smith during a time when Smith should have been in WA DOC custody. Smith was one of more than 3,200 inmates that were released early by the Washington State Department of Corrections over a 13 year period. 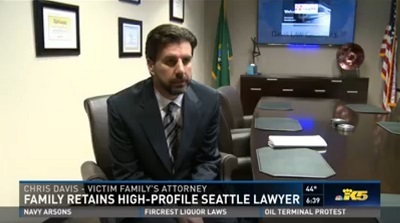 Davis Law Group has experience successfully handling cases against the Washington State Department of Corrections and is actively investigating the case. MEMBERS OF THE MEDIA: Please respect the privacy of the victim’s family and direct all media requests to Davis Law Group. Davis Law Group will do its best to accommodate press inquiries and requests for interviews with the victims and/or her attorney. PHOTO: This memorial was created by Ceasar's family in an effort to make him a part of their 2015 holiday celebrations.